Is there a better alternative to Playoff2012? Is Playoff2012 really the best app in Sports category? Will Playoff2012 work good on macOS 10.13.4? Playoff2012 is a simulation of a hypothetical single elimination 8-team playoff assumed to occur after the 2012 football season. The eight teams are chosen by the user from the 10 top teams in the final BCS standings in December 2012 The user can choose the teams and set the strength of each to any number from 1 to 10. 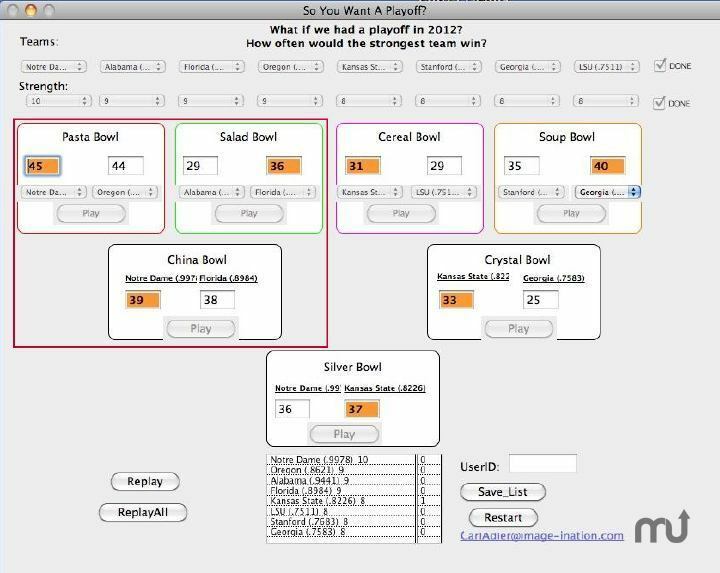 In particular, the user can choose the pairings to simulate the 4 team playoff planned for next year as part of the overall 8 team simulation. The results are surprising. Playoff2012 needs a review. Be the first to review this app and get the discussion started! Playoff2012 needs a rating. Be the first to rate this app and get the discussion started!